We are making chips for dinner a thing. Because we survived the hurricane! Kidding. The rain did zilch here, which of course is a good thing, and it definitely did some huge damage elsewhere. And honestly even if you aren’t in hurricane-land chips for dinner just sounds like a perfect idea, right? You know it does, admit it. 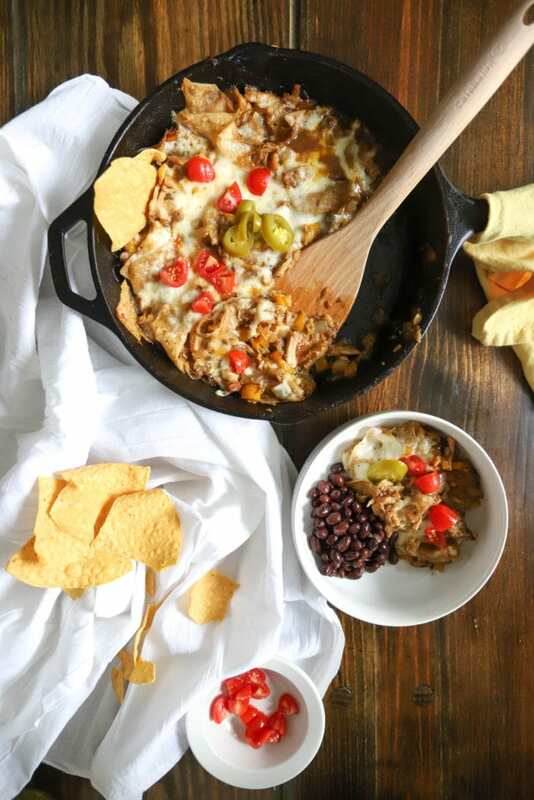 Chilaquiles is a generic Mexican dish that varies from region to region and household to household. It mostly involves sauce and fried tortillas. In this case we’re using leftover chips, the few handfuls at the bottom of the bag, the leftovers from takeout, you get it. 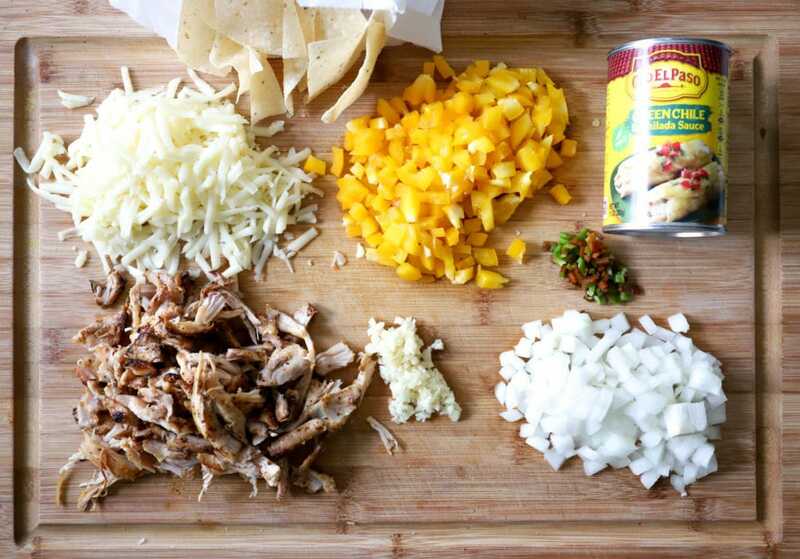 This version is super simple: you can make your own chicken OR use leftovers, and the sauce comes from a can. I love all things verde, but red enchilada sauce would be delicious here as well. The result is a 30-ish minute meal that includes chicken, veggies, and chips, so a well-rounded meal with tons of flavor and precious little effort. 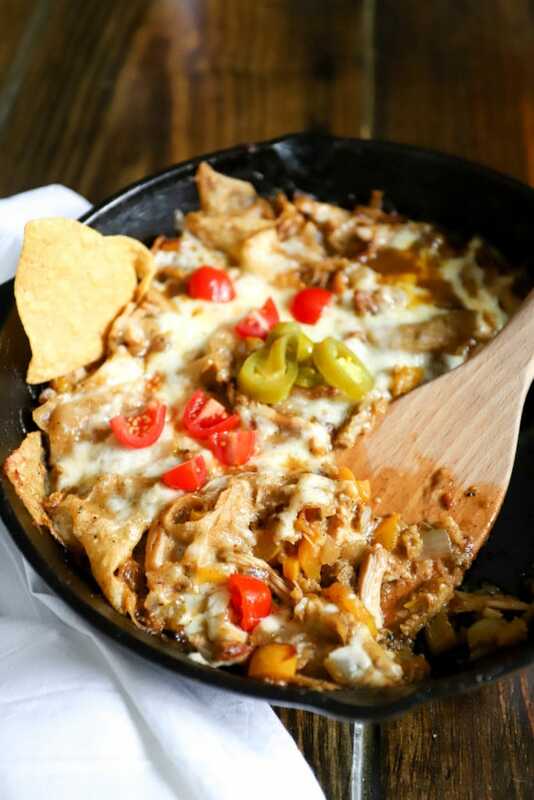 For this skillet-o-love (official term), you’ll need onion, garlic, bell pepper, jalapeno, enchilada sauce, shredded chicken and cheese, and chips. That’s it! I make chicken exactly the same as I do for this chicken taco salad, and it’s delicious every time. But! 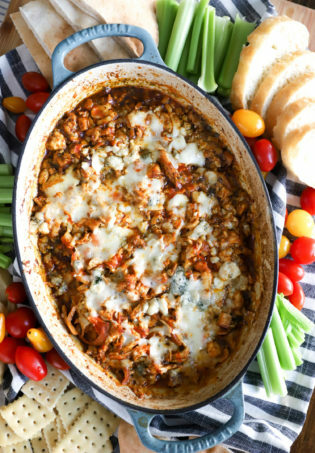 You can use any leftover shredded chicken you have and the dish will still have plenty of flavor from the veggies and sauce. Start by chopping and shredding the ingredients, then preheat an ovenproof skillet to medium-high heat with some olive oil. Preheat the oven to 375F. 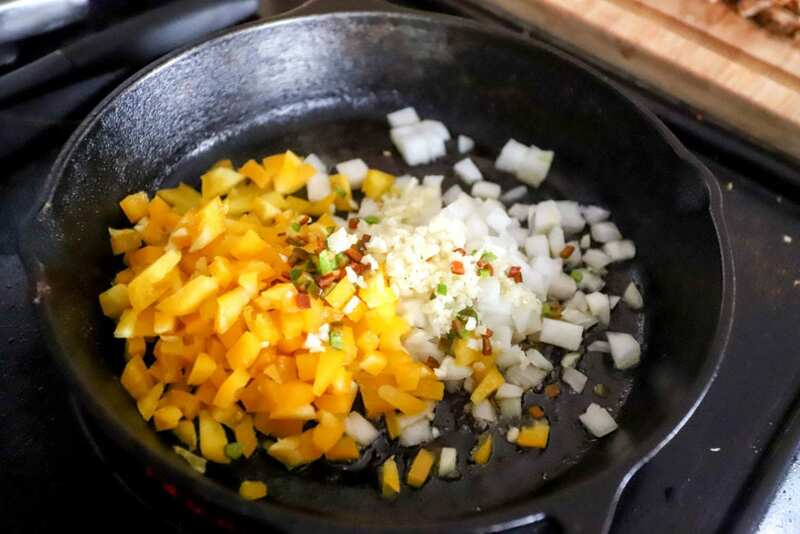 Add the bell pepper, onion, jalapeno, and garlic to the skillet with a sprinkle of salt, and saute for 5 minutes until the veggies start to soften. 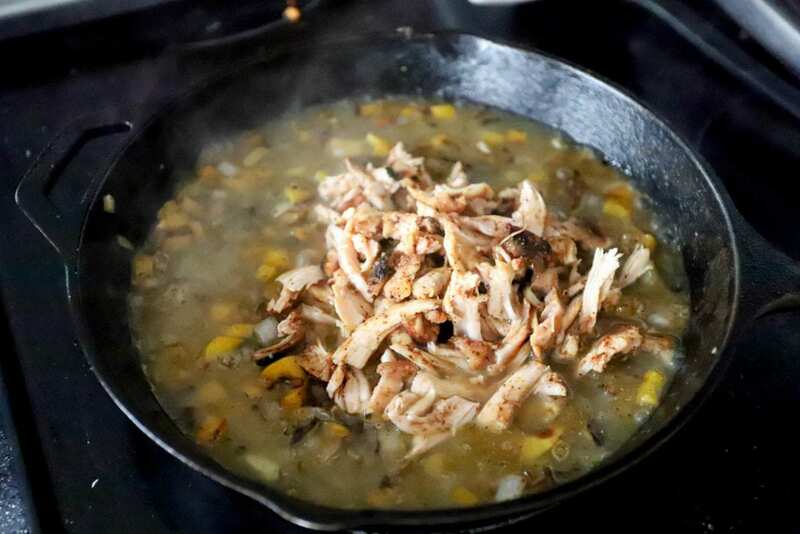 Then, add the enchilada sauce, chicken, and a few handfuls of chips to the skillet – I’d say two big handfuls, but we’re looking for an amount that won’t crowd the pan and will be the right quantity to be evenly coated with the verde sauce. 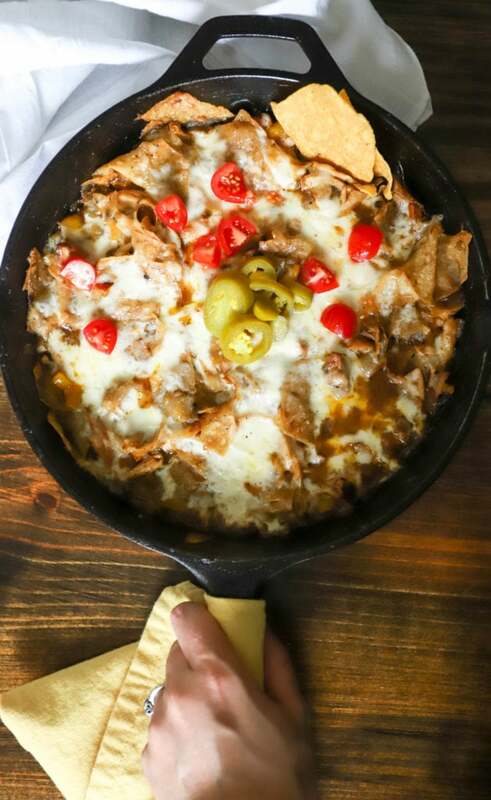 Sprinkle the cheese all over the chip/chicken mixture, and it’s time to bake the chilaquiles. 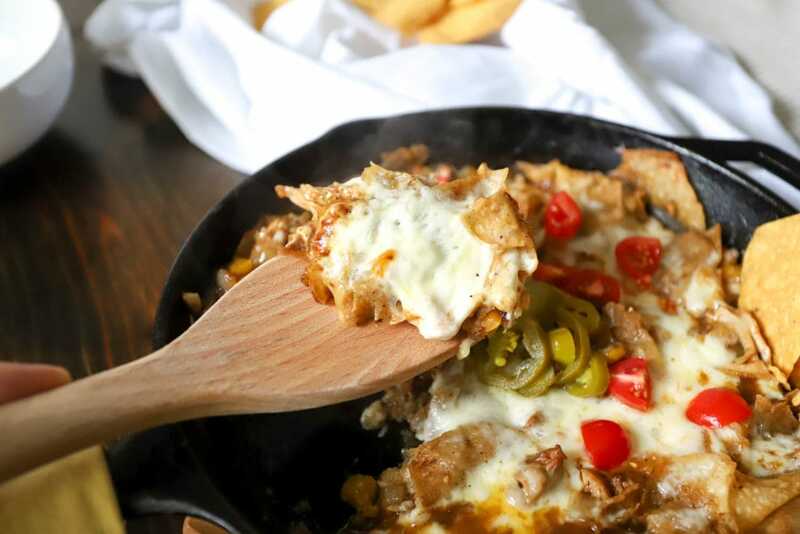 Bake the entire skillet for 10-15 minutes until the cheese is melted and the entire thing is bubbly. 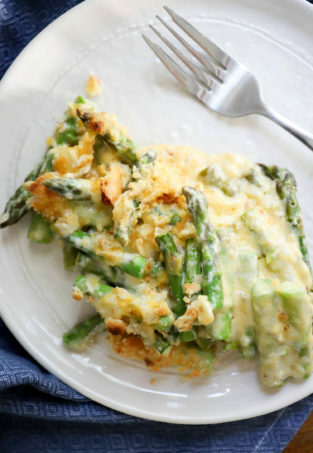 This gives some crisp to the edges of the cheese but doesn’t turn the entire skillet into mush. Chips for dinner, done. 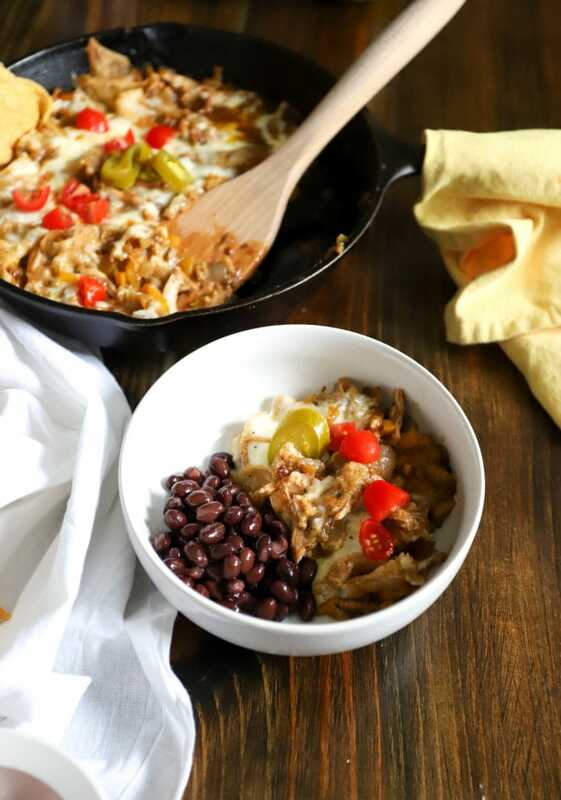 Top this with anything fresh you like (lime wedges, cilantro, sour cream, anything you like! ), and serve immediately. 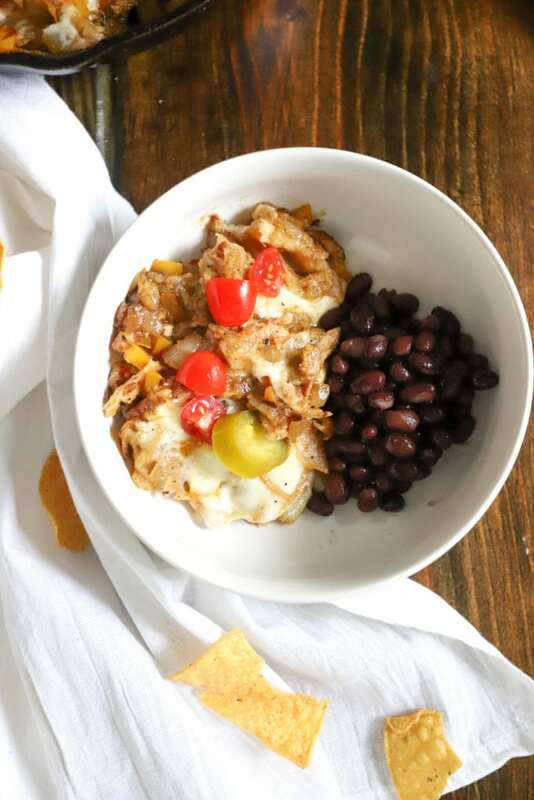 I love this with black beans and rice, which is definitely filling, but the chilaquiles on their own or with some shredded lettuce and tomatoes on the side is also delicious and slightly lighter. This is completely customizeable, too. You could use cooked and crumbled ground beef, extra veggies and no meat, a different kind of sauce, or even chopped cooked shrimp would be delicious. 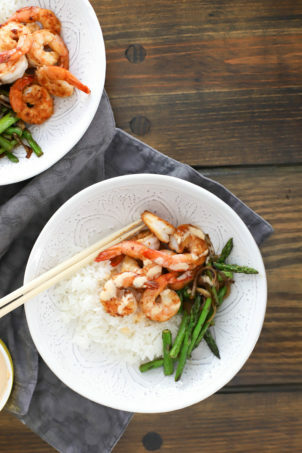 The end result is cozy and flavorful and just incredibly delicious even though it’s so simple. It’s also another “please let’s not throw random things away” recipe, so you’re SAVING THE EARTH, people. You’re welcome for an environmentally friendly Monday meal. Preheat the oven to 375F and a 10-inch ovenproof skillet to medium high heat with a drizzle of olive oil. 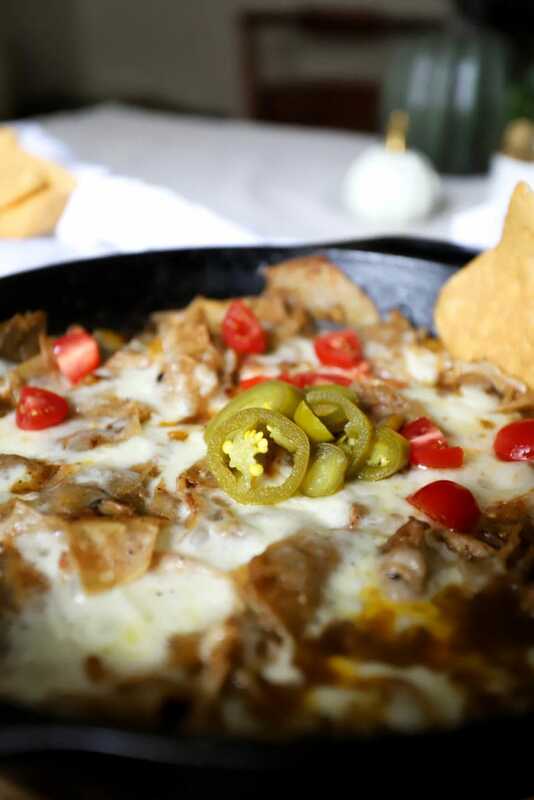 When the skillet is hot, add the bell pepper, onion, jalapeno, and garlic with a sprinkle of salt. Saute the veggies for five minutes, stirring as you go, until the veggies have softened slightly. 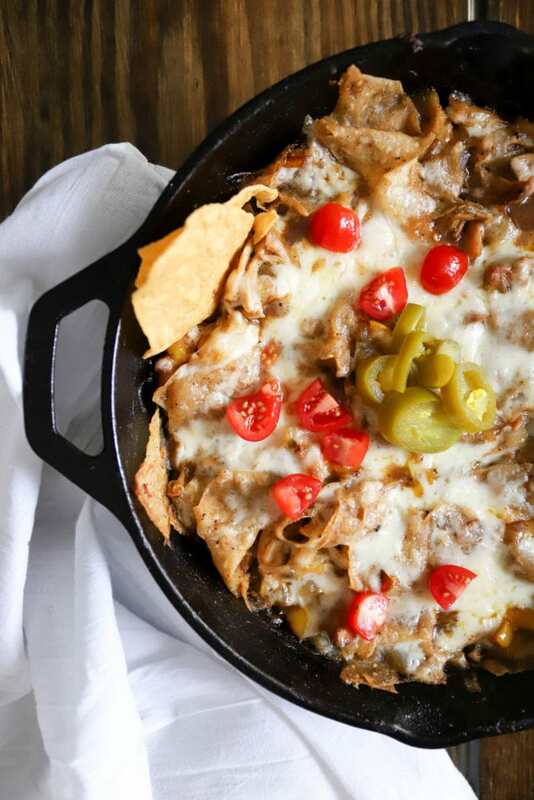 Add the chicken, chips, and enchilada sauce to the skillet and turn the heat off. Stir to coat everything evenly in sauce. 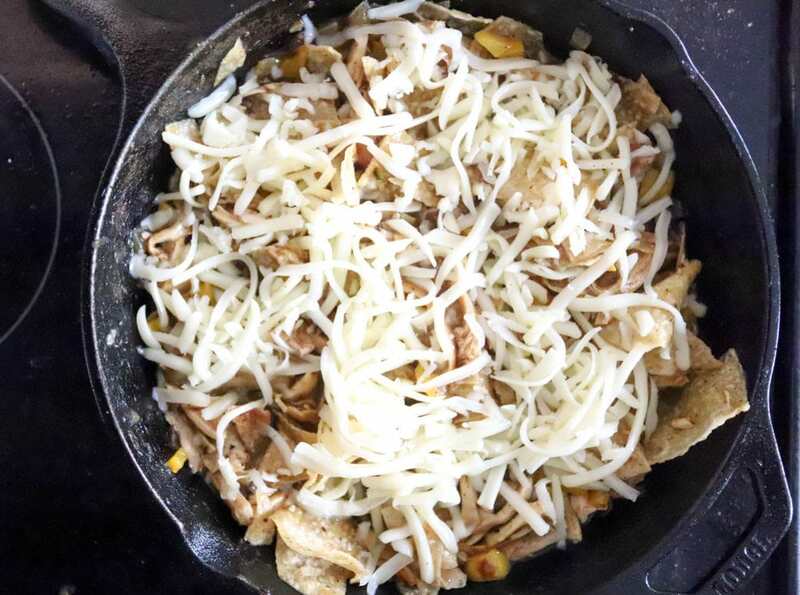 Top the skillet with all of the cheese and place in the oven. 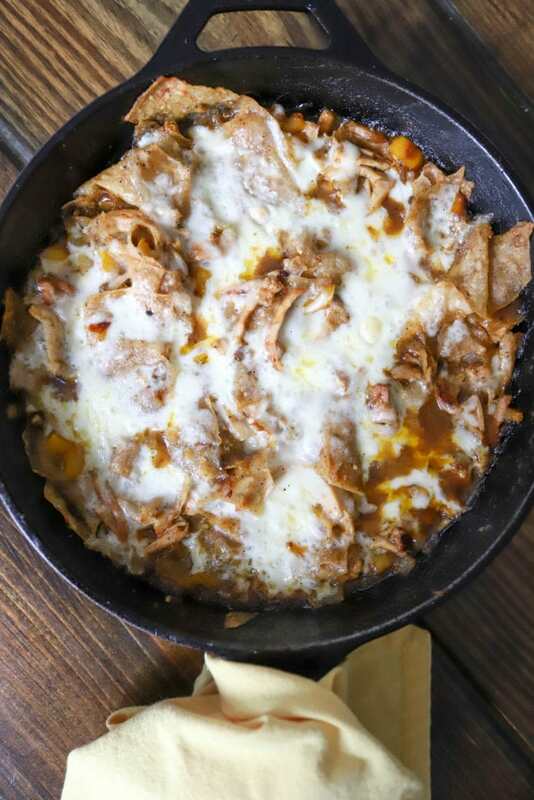 Bake the chilaquiles for 10-15 minutes until bubbly throughout and slightly crispy at the edges. Serve immediately topped with anything you like. 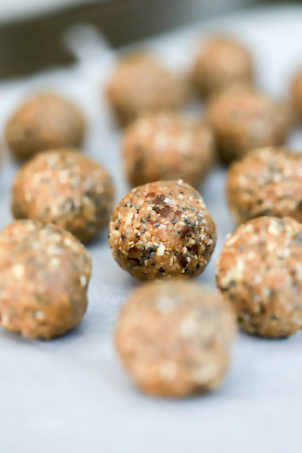 I love this alone or with black beans. Enjoy!